Morning Coffee & Afternoon Tea: Jasmine Cooler - Fun with Ice Cubes! Jasmine Cooler - Fun with Ice Cubes! When our summer days heat up, I start playing with ice cubes. It's hard to live in a place where I'm forced to switch my usual afternoon tea ritual from hot to iced. But it does push me to find new and creative cool drinks. I've made espresso ice cubes, tea ice cubes, jello ice cubes (which I do NOT recommend adding to a beverage), and all kinds of ice cream / soda combinations. 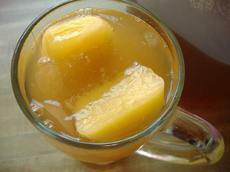 Add orange juice cubes and regular ice cubes to a tall glass and fill with tea. Add a slice of orange on the rim for fun and color! I love fruity ice cubes, they are a great addition to iced tea or 7-up or your favorite fuzzy water. 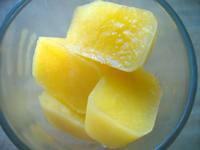 Lemonade cubes are wonderful added to almost any flavor iced tea. Enjoy, and stay cool! A stuff for both , who love iced solid and who love iced liquid. Wow! thats tea its a better drink for this coming summer,we love it for sure. Keep posting! Greetings from Singapore I am just passing by. This is such a great idea, I am going to do this asap, in this sunny weather, this is just great.